The main characters of Panique are three roommates who live out in the country: Cheval (Horse), Cowboy and Indian. Horse is the most serious and responsible of the bunch, while Cowboy and Indian are more immature and likely to get into trouble. Supporting characters include the local policeman at the roadside security booth, a mailman, the neighboring farmer who can only speak by shouting (and is very protective of his highly advanced tractor), his bucket-carrying wife, and their bevy of farm animals. With that context, let's talk about the film that the series inspired. 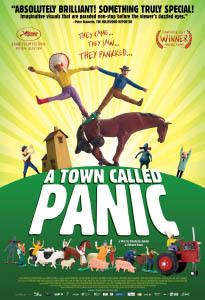 A Town Called Panic is rather difficult to describe. What makes it fun are all the odd, unexpected things that happen, so if I mention them, it'll ruin the surprise. "...And where is this going?" you might ask. This, sadly, is the film's main weakness. The whole thing feels like a series of shorts cobbled together; a leftover influence from the TV show. Each part of the film leads naturally into the next, and there's definitely an overall story arc, but along the way there's a nagging uncertainty about what it could possibly be leading up to, if anything. The climax of the movie also heavily plagiarizes one of the original shorts (Les voleurs de cartes). But if you've never seen that particular episode, no problem! Also, don't worry if you don't understand French, the English subtitles on the North American DVD release are excellent. Furry-wise, although none of the animals are humanoid, most of them can talk. Both the TV series and the movie maintain a remarkably consistent visual esthetic, from the strange cars to Horse's furniture and home appliances designed for his personal use. There are little extra details all over the place, like how the farmer's animals read and brush their teeth before bed. And Madame Longray (a mare, who only appears in the film) has a piano built for horses. She teaches music at the local Conservatory, and is a love interest for Horse, who's a bit bashful around her. Dawww. The absurdist style of the film may not be to everyone's tastes. It seems to polarize viewers; you either like it or hate it. I have a soft spot for absurdist comedy, so I like it. Here's a good litmus test: Watch the first episode of the original series. The animation quality is cruder and less polished, but it has the same ridiculous attitude as the film. (The main difference being that the film looks a lot better, and has a more complex plot.) Again, don't worry about the French; all you need to know is that the cake (Le gâteau) is not to be eaten until morning. You might also be interested in watching The Big Sleep, probably their most sophisticated short in terms of following a premise to its ultimate (if odd) conclusion. And finally, from the film itself, this clip shows how their neighbor eats breakfast. Basically, if you're in the mood for something silly, give this a try!